The Journey: Night flying, missionary passengers and other stuff. Night flying, missionary passengers and other stuff. Things have been busy since the last update. I have my night rating now, which means that I have no restrictions when it comes to being down before sunset. Not a big deal in the summer, but come winter, the days are so short that you have to be flying at night if you want to get any flying done at all. Night flying is very smooth and you can see other aircraft for miles around you. Most pilots choose to log most of their time at night as opposed to the day, if they have that option. I also had the chance to fly my first missionary to her destination. Perhaps a foreshadowing of things to come? She was in Medicine Hat and needed to get to Three Hills. Her name was Lori Lawson and is an English teacher at Morrison Academy in Taiwan. We had lots to talk about seeing as Morrison is very similar to Rift Valley Academy in Kenya. 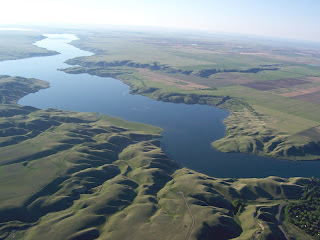 There's some fantastic scenery to fly over between here and Med Hat. Here's a large lake that I flew over. Other than that, Merilee is gradually showing more and is now entering her 8th month. She feels like it should be coming out any day now but there's technically still about two whole months to go. She's holding in there like a seasoned pro. She's awesome! Oh, I bought a sweet stunt kite at a garage sale for 2 bucks. They didn't really know what they had on their hands. I'll do a post on that when I have some good photos and some decent wind.